The Holy Trinity Ukrainian Orthodox Parish was established in Vancouver on May 9, 1937. The first Holy Liturgy was held on July 18, 1937 at the Ukrainian National Home. The following year, a fund was established for the building of a church. This was the pre-eminent goal of the Parish members over the following decade. In fact, they were greatly challenged by the intervention of World War II, Federal Government statutes and policies and the sheer size of the project they had undertaken. Nevertheless, through the deep commitment and perseverance of a small group of members, the structure was built according to the design of the famous architect Professor Serhyj Tymoshenko and the building project progressed. The Cross for the main cupola was blessed by Rev. Stephen Symchych on September 11, 1949. At Easter in 1950, the first Divine Liturgy was served in the newly-built, but as yet unfinished, church. This event represented an auspicious achievement. 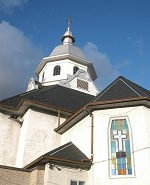 In the ensuing years, through much hard work and direct financial contributions by the members, along with fundraising projects, the church was eventually completed and decorated according to the Orthodox tradition. In 1970, the parish commenced planning and fundraising for another major project, the building of an Auditorium and Mezzanine immediately adjacent to the church property. The “Ukrainian Orthodox Auditorium” was officially opened on June 17, 1973. In December 1977, the Vancouver City Council designated our church as an architectural “Heritage Building” and an engraved plaque was placed on the exterior of the church building. It is also noteworthy that in 1975, our church was designated as a “Sobor” by Rt. Rev. Archbishop Andrew on behalf of the Ukrainian Greek-Orthodox Church of Canada,(renamed “The Ukrainian Orthodox Church of Canada (UOCC) by an Act of Parliament in 1990). In 1983, the “Sobor” status was raised further and our church received the designation of a “Cathedral”. Since its first Liturgy, the Parish has been served by fourteen (14) priests, in addition to receiving visitations from Bishops, Archbishops and Metropolitans of the UOCC. The Church Elders and Sisterhood have played and continue to play a prominent role in the care and maintenance of the church, along with their principal role of assisting with the conduct of church services. Altar boys have also received special instruction regarding their role during the Liturgy and other services; they continue to serve in this important capacity. Over the past number of decades, the Church Choir, Choir Directors and Cantors have played a very significant role in our Parish. They have greatly enriched the Church services in keeping with Orthodox traditions and religious practices. These important participants continue to enhance our services to the present day. Religious instruction in the Orthodox faith has been conducted from the early establishment of our Church Parish. Many volunteers have contributed to the Sunday School program. The classrooms in the lower level of the Church have also been used for a Ukrainian Language school and, again, this instructional program has thrived as a direct result of the contribution of many volunteers. Both these programs have been in operation from the very early days to the present with all the children participating in concerts to celebrate St. Nicholas, Taras Shevchenko and Mother’s Day on an annual basis, in addition to other cultural events. ** This summary is based largely on “A Brief History of the Holy Trinity Cathedral Parish in Vancouver 1937-1987”. This booklet was prepared for the 50th Anniversary of the Cathedral that was held on October 23, 1988. See what was happening in Vancouver on our important days in History!